Ferocactus, commonly called Barrel Cactus, lives anywhere from 50 to 130 years. It begins with a globular shape when young and eventually becomes more cylindrical, slowly reaching anywhere from 2 to 10 feet tall and 1.5 to 3 feet wide, depending on the species. Native to the American Southwest and Mexico, barrel cactus produces long thorns along its many ribs and bright 3-inch, cup-shaped blossoms in yellow and orange from mid-spring into summer. It grows best in U.S. Department of Agriculture plant hardiness zones 9 through 10. Light: Choose a planting location that receives direct sun during all or most of the day. Because Ferocactus eventually leans into the sun instead of growing precisely upright and because it has extremely sharp thorns, place it where people will not brush into it accidentally. Soil: Plant your cactus in early spring before new roots begin to form in late June and early July. The roots may appear dry, but that is typical before new growth begins. Dig a hole deep enough for the plant’s roots and amend it as needed to provide fast-draining soil. A good soil mixture includes 10 percent native soil, 45 percent washed sand or pumice and 45 percent compost. Ferocactus thrives in poor and arid soil. Water the cactus at the time of planting to anchor it into the soil. Water again only if the weather in your area is unseasonably dry and if normal spring or winter rainfall doesn’t occur. Water after it is established only during unseasonable drought conditions. Otherwise, rainfall provides the only irrigation necessary. 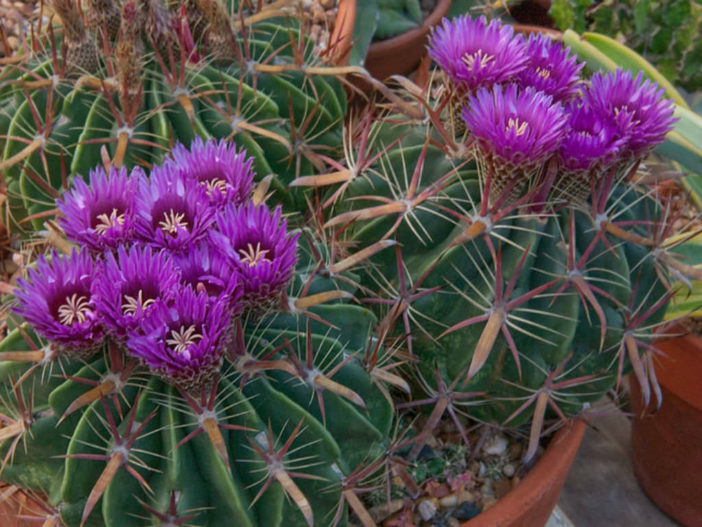 In fact, Ferocactus needs a dormant period with dry soil during the winter. Drape Ferocactus with burlap or other fabric if a heavy frost is predicted in your area, as it is sensitive and could be damaged by cold temperatures. Mulch your cactus with decomposed granite or small pebbles for decorative purposes to mimic the plant’s native habitat. Ferocactus is naturally fire-resistance and mulching with stone increases the fire-resistance of your entire landscape. Ferocactus thrives with no fertilizer. Like all succulents, Ferocactus will die if overwatered.